The recent election of the Rev. Amy Butler as senior pastor of New York City’s influential and historic Riverside Church, as well as the installation of a number of other women at high-profile American congregations, has brought new attention to the theological divide among religious groups concerning the ordination of women. While many major religious denominations in the United States now allow women to pastor churches and synagogues, only 11% of American congregations were led by women in 2012, according to press reports of an upcoming National Congregations Study survey. That figure hasn’t changed since 1998. 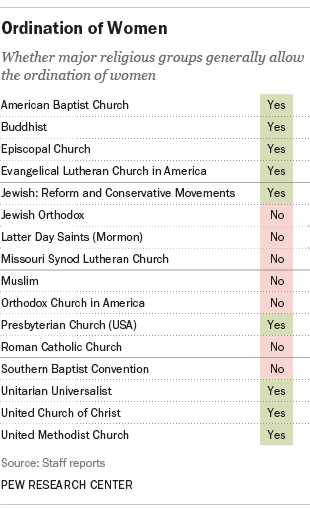 Many of the nation’s largest denominations, including Roman Catholics, Southern Baptists, Mormons (Latter-day Saints), and the Orthodox Church in America, do not ordain women or allow them to lead congregations. Other religious groups have taken small steps in the direction of female ordination. For instance, while there currently are no women in the U.S. serving as Orthodox Jewish rabbis, a number of women recently were ordained by one Orthodox seminary as maharats, or female leaders of Jewish law, spirituality and Torah – but they will not be given the title of rabbi. A number of American churches, such as the United Church of Christ (whose members were once called Congregationalists) and the Universalists (who eventually merged with the Unitarians) started ordaining women in the 19th century. But it wasn’t until the decades following World War II that many of the larger and more prominent denominations began to allow women into leadership roles. In 1956, the United Methodist Church and a part of what would become the Presbyterian Church USA ordained their first women ministers. The Evangelical Lutheran Church in America, Reform Judaism, and the Episcopal Church followed suit in the early 1970s. In recent years, women have ascended to a number of high-profile jobs in American churches. Many, including the Episcopal Church and the United Methodist Church, now allow women to be bishops and hold other top leadership positions. In 2006, for instance, the Episcopal Church, for the first time, elected a woman, Katherine Jefferts Schori, to be its presiding bishop, the church’s highest office.